The Japanese spacecraft Hayabusa 2 recently completed an initial check of its functions on Mar 3, three months after its launch on Dec 3, 2014, from Tanegashima Space Center on Tanegashima Island. Dubbed the “Asteroid Explorer” by the Japanese Aerospace Exploration Agency (JAXA), the probe is currently en route towards the near-Earth asteroid 1999 JU3. Hayabusa 2 is scheduled to reach the designated asteroid by mid-2018 where it will then land to collect samples to return to Earth by late 2020. 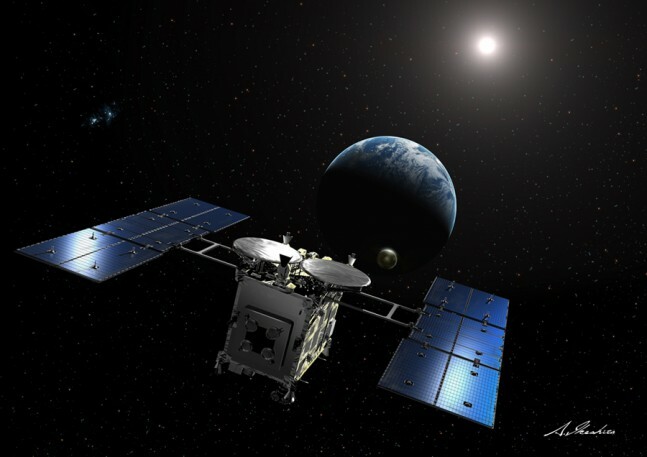 JAXA has stated that Hayabusa 2 is “ in good health” and that the spacecraft will remain in its current preparatory operational state as it prepares to swing back by the Earth around Nov. or Dec. of 2015. Hayabusa in Japanese means “peregrine falcon”, which is known as the fastest member of the animal kingdom. As of 12p.m. EST (2p.m. 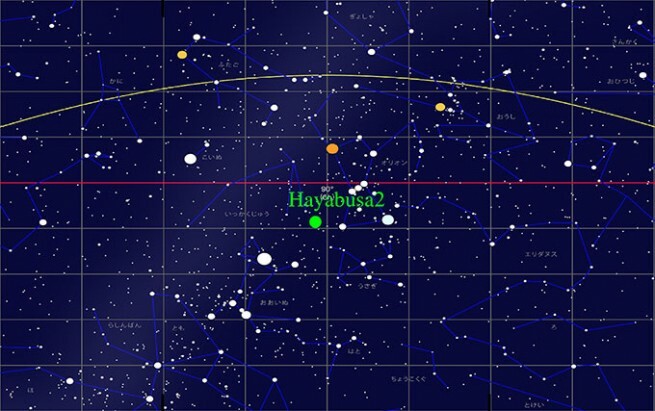 JST) on March 3, Hayabusa 2 was 100,942,000 mi (162,450,000 km) from the Sun and 223,072,000 mi (35,900,000 km) from the Earth with a navigation speed of 17 mi/s (27.36 km/s). Released also with Hayabusa’s progress update this month was a mission schedule and detailed check list of various routine tests that will be performed in regards to the spacecraft from its Dec. 2014 launch up until its return to Earth in 2020. Among these are various tests of Hayabusa’s ion engines and both of the small landers aboard, MINERVA-II and MASCOT. These two devices will aid in collection of samples as well as relay data and imagery about the asteroid’s surface back to the ground tracking stations in Japan. The details of the functions confirmation check list can be viewed on JAXA’s website directly. Hayabusa 2 will be the second of its kind to land on an asteroid and collect samples. The first Hayabusa (also known as MUSES-C/Mu Space Engineering Spacecraft C) was launched on May 9, 2003, and rendezvoused with the asteroid Itokawa in mid-Sept. of 2005. It was the first ever spacecraft to return asteroidal material safely to Earth for analysis. The spacecraft’s mission is to not only help prevent the threats of an asteroid colliding with our planet, but also to better understand the origins of the Solar System. Samples that will be collected from the 1999 JU3 asteroid will be some of the oldest types of rock in the Solar System and may be able to provide scientists with a deeper understanding of our vast universe. 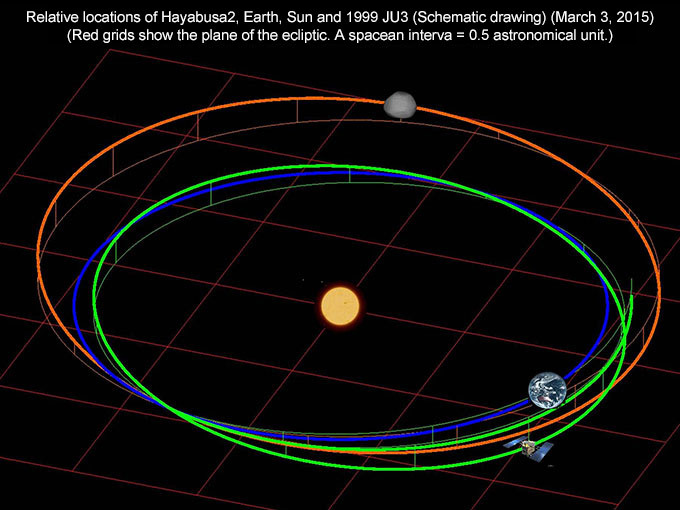 Please check back with SpaceFlight Insider for updates on the Hayabusa 2 mission in the upcoming months.